Choi Jung Won of KBS2 TV’s Monday and Tuesday drama series “Brain” donated her portraiture right for the “street angels,” attracting everybody’s attention. Recently, Choi Jung Won graced the cover of Big Issue magazine as the model, and donated her portraiture right. Big Issue is a magazine where the sales is in charged by the homeless and some part of the income will be given to them. It serves as the magazine which is giving the homeless “an opportunity to stand up again,” and is issued in more than 40 countries around the world. 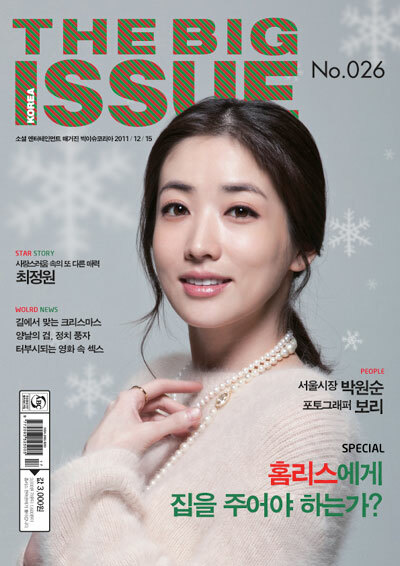 Choi Jung Woon appears as the cover model of issue 26 of Korean version of “Big Issue.” She deeply identified with the purposes of magazine publishing, so very readily accepted the proposal as the cover model. The “Big Issue” with Choi Jung Won as the cover model will be issued beginning December 15th, 2011, and the interview of Choi Jung Woon will also make public in more than 40 countries around the world. Currently, Choi Jung Won is playing the role of kindhearted neurosurgeon Yoon Ji Hye in Brain drama. On the other hand, the Perfect Game which starred by her and Cho Seung-Woo will start premiere on December 21st, 2011.